Data control tools allow you to configure what personal data (types) Nosto will process and store to produce personalisation features. Nosto will cease to process the specified customer information from the time data control settings are adjusted. Please note that these controls won't remove any existing data. 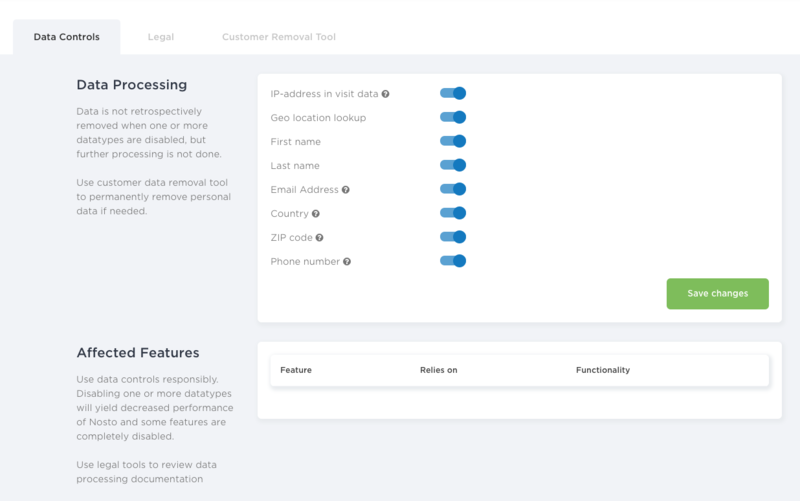 Use customer data removal tool to permanently remove personal data if needed and requested by your clients. When processing one or more data types is disabled, Nosto's performance and personalisation effects will be negatively affected. Some features such as Triggered Emails are completely disabled if Nosto can't process email addresses. Before saving the settings you can see a list of affected features and overall impact. Please use controls responsibly for example when your company policy requires stricter data privacy rules.